Does popcorn increase weight if made without oil? Ketogenic diet menu for easy weight loss health Does popcorn increase weight if made without oil? Do popcorn contain calories and are they healthy? The caloric value of popcorn has always been a topic by itself, and even the nutritionists tend to give different - opposite opinions. Does popcorn fatten or does it not, is the dilemma that has long attracted attention, we believe that this is because we love to nibble on them while watching movies, popular series or follow sporting events, and yet we love to know where we stand with them. We often get the question whether we should eat popcorn without oil during dieting or should we eat popcorn during pregnancy and the like. Therefore, we have decided to deal with popcorn in this article. The answer to the question of how many calories are in 100 grams of popcorn is very simple - depends on the way they are prepared. In the event that you create them in the hot air, without oil and add them only a small amount of salt, they will contain a total of 382 calories and from that you will definitely not gain weight. The caloric value of the popcorn is significantly increased if they are combined with other additives and you need to keep that in mind. Classic cinema version of this irresistible snacks is definitely not healthy, because it contains more calories, almost twice as much. With them particularly harmful are those we buy, as they are industrially processed, added toppings from hydrogenated oils, sugar, sweeteners, artificial flavours, as well as unhealthy taste enhancers that contain trans - fats and higher amounts of salt. So, forget about the slim waist and slim line, if you are planning to buy this snack in the supermarket or on the street. 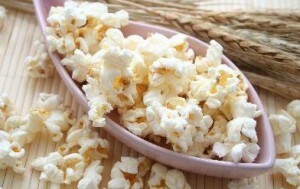 Also popcorn with cheese or butter contains 532 calories in just one hundred grams, almost 150 g more - much, much more. Forget the greased pan and snap popcorn everywhere, because with only one large tablespoon oil, calorific value rises to as much as 517 calories. As you can see to the question of whether the popcorn is fattening there is no single answer, it depends on how you prepare them. Less salty snacks are our choice, because larger amounts of sodium are not good, they contain water and retain it in the body much longer, and therefore it will be much harder to get rid of it. Water retention causes edema, bloating and swelling of the body, especially in the legs, so make popcorn without oil and put a little salt on them. Slightly salty popcorn without oil certainly are healthy because they contain valuable amounts of fibre, which will help our metabolism to work better. They are useful for health as a whole, are not harmful and with them you will not gain weight. Foods rich in fibre are always welcome, improve bowel movement and cleans us from deposited sludge and harmful toxins. Nutritionists draw attention to the fact that the daily amount of fibre that is average into our body is about 15 grams, which is twice less than our daily needs. If you consume a healthy popcorn without additives 100 grams during the day, you will compensate this lack very quickly. Furthermore, if we add to everything popcorn without oil, they have a high content of antioxidant elements as well as beta carotene (66 micrograms per 100 grams). That's the reason more to prepare a bowl of this irresistible snack – you should not feel guilty if they are free of oil, you will not put on weight. In addition for better digestion and slender waist, they are useful for the health of our skin. They contain vitamins B2 and B1, calcium, iron and phosphorus. Note: popcorns from the microwave are not the best choice, because the snacks for this purpose is coated with a variety of artificial substances, which are not the healthiest and are known to cause allergic reactions in people who have an increased tendency to allergies and therefore these are not recommended to pregnant women. Cinema snack can be made at home in several ways. It is best if you have a popcorn maker and add a little salt and no oil. They can be made in the microwave or in the old fashioned way in a pot or pan that is covered. Popcorn pop at approximately 175 degrees. For these prepared in a saucepan or pot, you will need a drop of oil and a good pinch of salt. Place on preheated burner, a pot where the bottom is covered with popcorn and cover it. When they start popping shake them a few times, and there is a surprise, a full pot of your delicious snacks, there is not much else than to sit back and enjoy a good quality movie or sports. Men sometimes abuse this snack, because they like to combine it with beer, with a note - "they are a great match” then with calories, health and weight loss do not go together. Educate them a little bit, not everything goes smoothly. We almost forgot, during UN diet, you can eat popcorn during the day for carbohydrates. Always make healthy popcorn without oil, it is best to eat them as an afternoon snack.